NHL.com continues its preview of the 2015-16 season, which will include in-depth looks at all 30 teams. It's up to the Montreal Canadiens to walk through it. The Canadiens are not a clear favorite to win the Stanley Cup this season, but their roster is primed to contend for one. Led by goalie Carey Price, the Canadiens have a star player at each position, with left wing Max Pacioretty's place as one of the NHL's top goal scorers now cemented and P.K. Subban proving he is among the five best defensemen in the League. All three are in the primes of their careers, seemingly ready to make a run to the Cup. 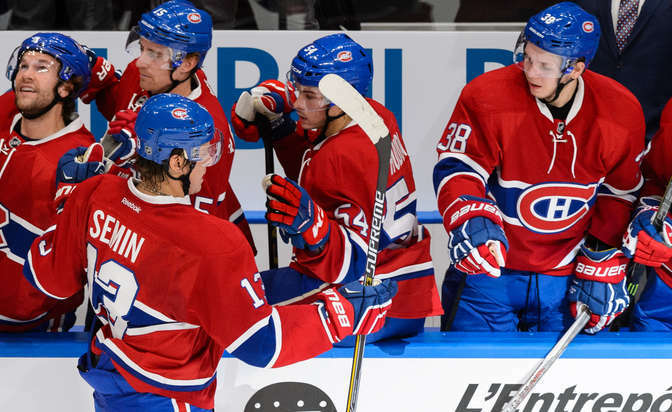 The question is whether the supporting cast surrounding them can do enough to lift the Canadiens into true contender status. General manager Marc Bergevin and coach Michel Therrien are reluctant to set expectations too high, but Subban isn't. "I know that for me, I'm getting anxious," Subban said prior to the start of training camp. "I don't want to wait another two or three years for people to say now you're a Stanley Cup contender. I want to win one now." Bergevin made the Canadiens younger over the offseason and the core has gathered experience playing five rounds in the Stanley Cup Playoffs over the past two seasons. Now is the time to use it. The pressure is on this group to provide the Canadiens with more offense, their most glaring weakness. The hope is an important position switch could accomplish that. After three seasons playing primarily on left wing the Canadiens intend to use Alex Galchenyuk at his natural position of center this season, and that decision has a ripple effect on the entire forward group. The move to the middle pushed Lars Eller from third line center to Galchenyuk's left wing, a line that will be completed by free agent signing Alexander Semin on the right side. The line showed instant chemistry in training camp, and Eller will get an opportunity to prove he can be productive in an offensive role for essentially the first time in his NHL career. Center David Desharnais did not have to switch positions, but he will be switching roles because of Galchenyuk's move to center. He spent all of training camp playing with Tomas Fleischmann at left wing and Dale Weise on the right on the third line. After playing as Montreal's top-line center for most of the past four seasons it could be an adjustment for Desharnais, but having him on a third line also signals a shift for Therrien. The Canadiens will no longer have a top-six and bottom-six setup, but rather a three-line attack. "A player can't make the mistake to think that just because they were moved down the lineup that they only need to play well defensively and everything will be fine," Therrien said. "We want our players to be responsible with the puck, responsible without the puck and we want our players to produce." Pacioretty will play left wing with Tomas Plekanec at center and Brendan Gallagher at right wing on Montreal's top line, a trio that finished the playoffs together and will remain intact to start this season. That leaves a dogfight on the wings of Montreal's fourth line, with the only assured spot belonging to center Torrey Mitchell. Newcomer Zack Kassian and Devante Smith-Pelly will be competing to play on the right side, and Jacob De La Rose and Brian Flynn are the candidates to play left wing. The top pair of Subban and Andrei Markov is among the best in the League. They eat up most of the difficult minutes against the opposition's top forwards at 5-on-5, and are used on the top power-play and penalty-killing units. The problem in the past has been that the Canadiens appeared lost when Subban and Markov weren't on the ice, but that could change this season. Bergevin acquired Jeff Petry prior to the NHL Trade Deadline last season and then signed him to a six-year, $33 million contract before he could hit unrestricted free agency. Petry showed during the playoffs how he can help drive the play toward the offensive end, which will help Montreal stay above water while the top pair is getting a rest. He is currently slotted on the second pair with Alexei Emelin, who is coming off a difficult season but could benefit from having an excellent puck mover on his right. Nathan Beaulieu anchors the third pairing after establishing himself as an NHL player last season. He brings many of the same qualities as Petry and could be ready to move his way up the lineup. Tom Gilbert will start the season on Beaulieu's right, but will be pushed by Greg Pateryn for that spot. Jarred Tinordi will need to bump Markov, Emelin or Beaulieu out of the lineup in order to get in on the left side, which does not look likely. Tinordi is a big, mobile and physical player, but still needs to show he has the mental makeup to play in the NHL. Price is the reason the Canadiens can win the Stanley Cup. Simple as that. There is little doubt who the best goaltender in the NHL was last season, with Price leading the League in save percentage (.933), goals-against average (1.96) and wins (44). Whether Price can follow up that historic performance with something similar is still unknown. Common sense would dictate Price will take a step back, even if it's a minor one, simply because he set the bar so high last season. But Price is convinced he'll respond by using the same mental approach that allowed him to put up those outrageous numbers in the first place. "I have to keep focused on the process, I can't focus on the end goal," Price said. "Obviously we wanted to win it all last year and ultimately that's what we're working towards, but it's basically trying to focus on what it takes to get there." Dustin Tokarski and Mike Condon are competing for the job as Price's backup. Condon has been the better goalie in training camp, stopping all 38 shots he faced in two preseason games. Plekanec perfectly summed up what was missing from the power play last season. The Canadiens were 23rd on the power play at 16.5 percent and even worse in the playoffs, scoring twice on 36 chances. Bergevin signed Semin in the hopes he could help jump start the power play, though he didn't score once with the man advantage last season with the Carolina Hurricanes. Kassian could also be used as a net front presence, Eller should see significant time on the power play for the first time and having Petry all season will help. With Subban, Markov, Beaulieu, Pacioretty, Galchenyuk, Gallagher and Plekanec also on the power play, the talent appears to be there. Now it needs to produce. "I have a good feeling about the group that we have," Subban said. "We definitely have enough weapons to do some damage." The penalty kill, anchored by Price, was tied for seventh in the League last season at 83.7 percent. Forward Brandon Prust is the only player who significantly contributed to that performance who isn't back this season. Therrien has a record of 125-64-23 over three seasons in his second stint with Montreal. Yet he remains a target of constant criticism. The Canadiens are often labeled as a team that plays a very defensive style, but it would be better described as a puck pursuit style. Montreal regularly chips the puck up the ice in order to reach the offensive zone, relying on good team speed to win those pucks back. It is a system that is safe but which also leads to turnovers, though they are often far from the Canadiens net. That system will be scrutinized all season, especially if the Canadiens still struggle to score. The Canadiens added Craig Ramsey as a coaching consultant in the offseason, and he will help assistant coach Jean-Jacques Daigneault run the power play. Daigneault takes over on power play duty from Dan Lacroix, who inherits Daigneault's old job running the penalty kill with assistant Clement Jodoin.